Guardian lions, also known as foo dogs, are intimidating, mythical, lion-like creatures seen across a breath of art forms, ranging from architecture to tattoos. As they symbolize prosperity, success, and guardianship, they're full of meaning—which has made them popular in Western art too. Even the misnomer likely arose from a Westernized combination of mispronunciation and confusion. The words fo and fu mean "Buddha" in Chinese, and foo dogs resemble two Chinese dog breeds associated with lions: the shih tzu ("lion dog") and the chow chow ("puffy lion dog"). And so, foo + dog became foo dog. More accurately, though, they're "guardian lions," and should be referred to as such. If you're willing to pay the proper cultural respect, and want a fierce, meaningful tattoo design rich in both Asian history and symbolism, a guardian lion may what you're looking for for you. Since as early as 208 BC, Chinese Buddhism has taught that these mythical guardian lions have special protective powers. According to legend, their sole mission has always been to keep watch over Buddhist temples. 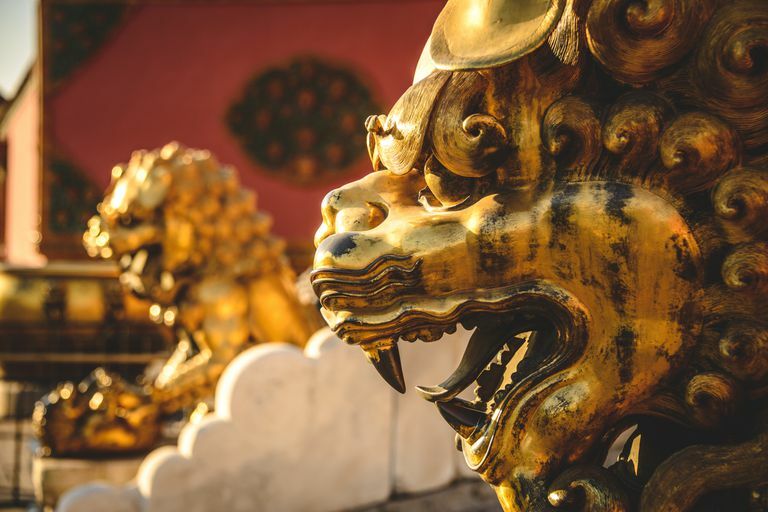 Statues of guardian lions still stand guard over innumerable buildings throughout China and 10 other countries in Asia; Opulent homes and government buildings are just as likely to be home to guardian lions as imperial tombs, temples, and palaces. Even commercial structures, such as stores, hotels, and other businesses, prominently display guardian lions, each of which silently keeps watch over the domain. Guardian lions often also adorn artistic pieces like pottery and paintings. Buddhism's teachings consider the lion a sacred creature. Lions represent peace, and are believed to impart calmness onto anyone who bears their mark. Conversely, they also represent energy and happiness. They almost always appear in pairs, whether it be in statue or tattoo form. Together, they are said to represent the binary: they're a study in contrast and complement, strength moderated by gentleness and wisdom, or more simply yin and yang. If you've decided to make this symbol a part of your body, first among the things you should think about is size. Often, lion guardian tattoos are rather large. The fact that they traditionally travel in pairs alone makes for a bigger design, but they also tend to be very elaborate, colorful, and detailed. For a lion guardian tattoo to work, it has to be large enough so you can appreciate its detail —and so your tattoo artist has a good shot at rendering it well. Given the size and detail, you're going to be investing a bit in terms of time, pain, and money, so putting a lot of thought into the placement of the design is best. The arms, torso, and thighs are good choices. Some people split the guardians between sides, with one guardian lion on each side of the chest or on each arm. Some research and your imagination can yield some beautiful results.